Photo of the West Garage project site, April 24, 2017. Shows new foundations being installed, with building 39 and 311 in the background. Precast concrete is a very typical material for garage construction in the industry today, the West Garage will be largely constructed of this material, with an aluminum screening system, and planters. Given the scale of the pieces of precast, they will be delivery one-piece-at-a-time via truck. Once on site they will be lifted into place by a large crane, capable of lifting these large pieces to all the heights required. The crane will be brought in by truck in pieces, assembled, and then inspected. This process is estimated at 4 days, from May 8th – May 11th. After this is complete, pieces of precast will start to arrive and placed. It is anticipated that the frequency of these trucks will be 15-20 per day, Monday thru Friday. The placement of all the pieces (~950), is scheduled to continue through September. The main entrance to site off School Street, on the campus will remain and continue to be the primary entrance. However, given the scale and frequency of trucks through this entrance it could lead to times when it is not readily available. The team has looked to alleviate some of the pressure on the intersection between North Beacon Street and Charles River Road which services this entrance, by opening two additional permanent entrances early. The North-East corner adjacent to building 311, and in the South West corner where ultimately the entrance will serve the park and bike path. 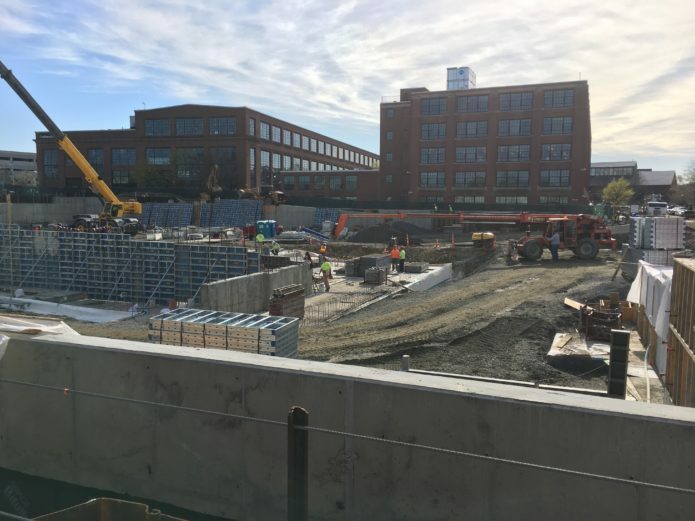 The two openings will have different purposes; the NE will allow sub-contractor traffic into the site, the SW corner will be used by exiting empty trailers from precast deliveries, as they head West on North Beacon Street. 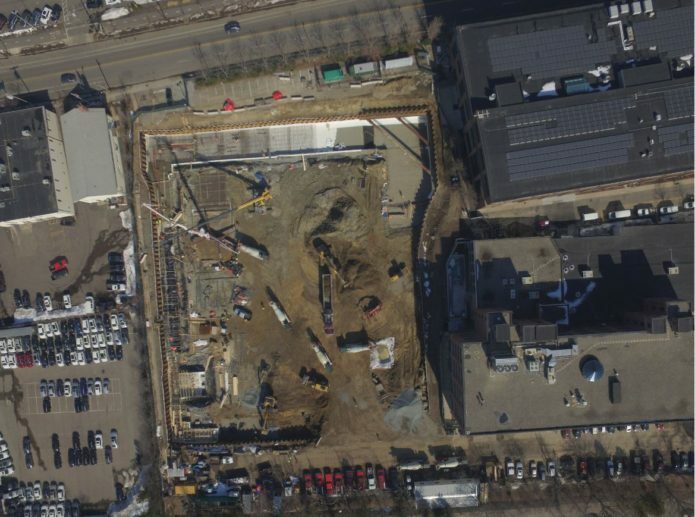 This image shows an aerial view from February 22, 2017 with North Beacon Street at the south, looking at the new garage and pocket park construction site. Building 39 and 311 are shown adjacent. The trucking routes for the West Garage has been refined over the last few months, with discussion from Town Staff, DCR, and the construction team with trucking company input. After review of many alternatives, the safest way to approach the site will be via Charles River Road and enter through the intersection with North Beacon Street. North Beacon Street will continue to be used for other construction traffic. The team remains the same to when construction started. With General Contractor C.E. Floyd Company, Inc., The Athena Arsenal LLC is working PMA Consultants as the Owner’s Representative Project Managers. The athenaEnvironment Construction team is overseeing the project for Athena Arsenal LLC. There are many contractors and suppliers that are dedicated to making this project a success, both logistically and from the perspective of safety. The main point of contact for all project related questions received by the team remains as garage@athenahealth.com. The next few month will be busy with additional work outside of the campus as well; this work will be coordinated with Watertown Town staff, DPW, Watertown Police, and DCR as needed. This work will include utility connections into the streets, and intersection installations and improvements. The two intersections that are predominantly impacted are Arsenal Street and Woolley Ave (inactive-campus entrance) and North Beacon Street with Charles River Road.